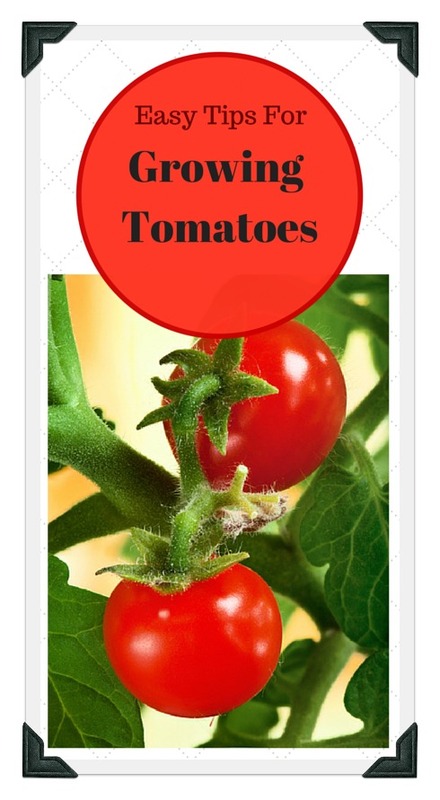 Here are some great tips and plans for growing tomatoes including how to plant tomatoes and fertilizing tomatoes, and tips for watering tomato plants. Planting tomatoes in most any type of home vegetable garden including raised bed, container, potted, vertical, and indoor vegetable gardens is fun and easy! You will be rewarded with an amazing abundance of delicious fresh tomatoes. 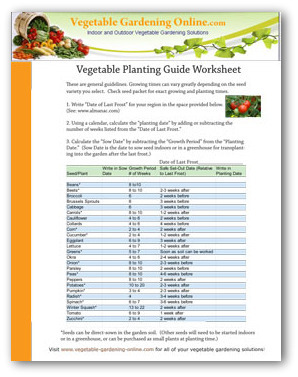 When planning a vegetable garden, large or small, planting a tomato plant or two is a must. There are so many great varieties from which to choose; from small cherry tomatoes, to medium sizes for salads and sauces, and large slicing varieties. Nothing tastes better than a vine-ripened home-grown tomato. If you haven't yet eaten one, you are missing out on one of the greater pleasures in life! Store-bought tomatoes pale in comparison. So, if you don't believe me, try growing tomatoes in your garden and see for yourself! When choosing tomato cultivars, it all depends on your preferences. If you’re for flavor, then home cultivars are best. If you want uniformity in size and shape as well as pest and disease resistance, then commercial cultivars are for you. 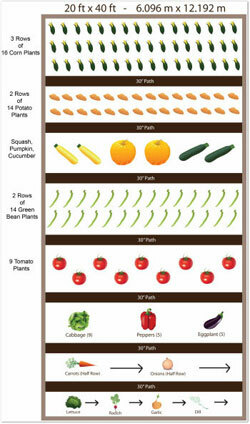 With over 7,500 tomato varieties, you might not know where to begin in choosing tomato plants for your garden. Luckily, most garden centers only offer 5 to 10 of the most popular varieties that will grow well in your area and climate. You might want to start with one cherry tomato, and one larger variety such as "Early Girl", or "Beefsteak" which are both good for slicing, sauces, and salads. 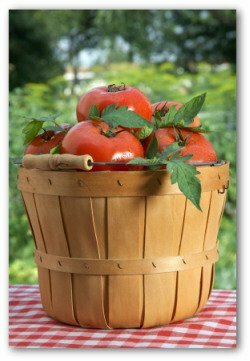 If you plant more than one plant, be prepared to give away tomatoes to friends and neighbors, or perhaps you will want to try your hand at canning your own homemade salsa, sauce, or tomato juice. It is time to plant tomatoes in the ground when the weather starts to warm, after all danger of frost has passed. 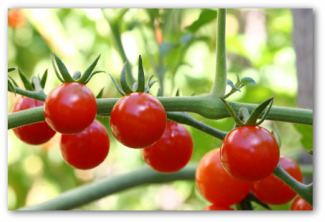 This is because growing tomatoes prefer 8 hours of sunlight a day at temperatures between 65 to 85 degrees Fahrenheit. The ideal conditions necessary for successfully growing tomatoes are soil pH levels of 5.5 to 6.8, presence of abundant organic fertilizer or compost in the soil, and deep planting. If possible, till generous compost matter into the soil. Depending on your choice of varieties to be planted, you will have to allocate space between plants from 12 inches apart (dwarf varieties) to 36 inches apart (trellised types). Many gardeners recommending planting your tomato plants by laying them at a 45 degree angle, and covering not only the roots, but one half of the plant with soil. Surprisingly, the tomato plant starts growing straight upwards in just a few days time. Tomatoes make excellent container plants. 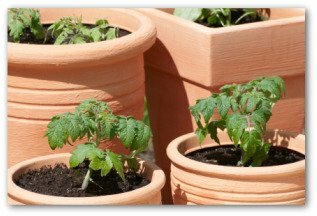 If you are limited for garden space, growing tomatoes in pots placed in a sunny location will provide an abundance of fruit. 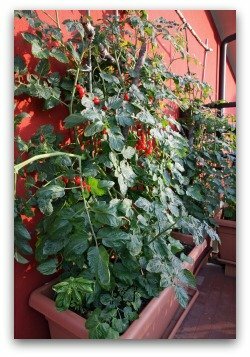 Tomatoes are always a good choice when planning a container garden in a sunny location. Use a good quality potting soil with added compost or fertilizer to fill your containers. Immediately after you transplant your tomato plant, place a "tomato cage" over the small plant. As your plant grows, it will have the necessary support in place to keep it upright, and to keep the branches from breaking. 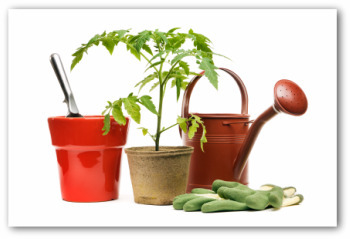 As to water and fertilizer, just make sure that these are provided to your growing tomato plants in moderate quantities. 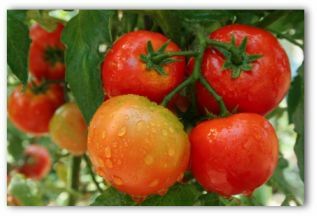 Organic tomato fertilizer can be either liquid fish fertilizer, or organic compost and well-aged manure worked well into the soil. Liquid fish fertilizer works well when applied at 3 week intervals. It also helps if you have planted your tomato plants in compost-enriched soil. Once the plant is well established and small tomatoes are beginning to grow, it is not necessary or desirable to water as often. Infrequent deep watering is best at this point. Although you can cultivate tomatoes from seeds, as a beginner when planting tomato plants, you should start with tomato transplant varieties. You can purchase tomato transplants at your local garden center. Shop early, as garden centers and online stores sometimes sell out of the more popular tomato varieties early. When setting out tomato transplants, you can add starter fertilizer if needed, and cultivate it into the soil. Transplanting growing tomatoes as a beginner is sometimes a challenge, as you do not want to disturb the plant's fragile roots when transplanting. Also, you will want to transplant tomato plants during cloudy days or in late afternoons. If you must transplant tomatoes when the sun is very hot, provide temporary shade for the plants, even that made of newspapers. If possible, build trellises or cages to support the tomato vine, and help keep the fruit off the ground. When planting tomato plants, always plant them on their sides and then cover the whole root and part of the stem with soil. Don’t worry since the plant will grow upright in just a few days. You may also want to trim your tomato plants to maximize their growth. Be sure to trim only the non-fruit bearing branches. These branches do not have any flower blossoms or small tomatoes growing on them. As you can see, growing tomatoes is quite easy. And nothing in the world beats the taste of fresh home grown tomatoes from your vegetable garden! You will be amazed at how delicious and flavorful vine ripened tomatoes taste. You will save money and enjoy much superior flavor with your home-grown tomatoes.